So many weeks out sick means that we are incredibly behind on everything. We started the flu with all our planting just ahead of us. We end it with, “rats…is it too late to…?” I am trying to just keep working through it in a reasonable way, but I often feel like my head is going to explode. Still, being crazy beats being sick! I finally went out and finished the orchard pruning. Bethel seems to have a knack for it. When I was undecided, she would advise, and did so well. I asked her how she knew what to do and she said that she’d seen well-pruned trees before. And I spent hours reading about it! She’s such a many-gifted girl. I hope she can learn to delight in the good work that her gifts could lead to. One of our peach trees is oozing gelatinous stuff. I have read that it could be the result of bacterial canker, borers or “growing pains” in young trees. I am really hoping for the third option. Also, I really need to sharpen my pruning shears. Those last cuts were far from beautiful. Garden bed building is stalled out for now until my husband can scratch out some time to work on it. And on my part it is hard to get excited about expending effort on seed-starting when I’m not sure when there will be beds to plant things in. If only we both had super-powers and required no sleep. 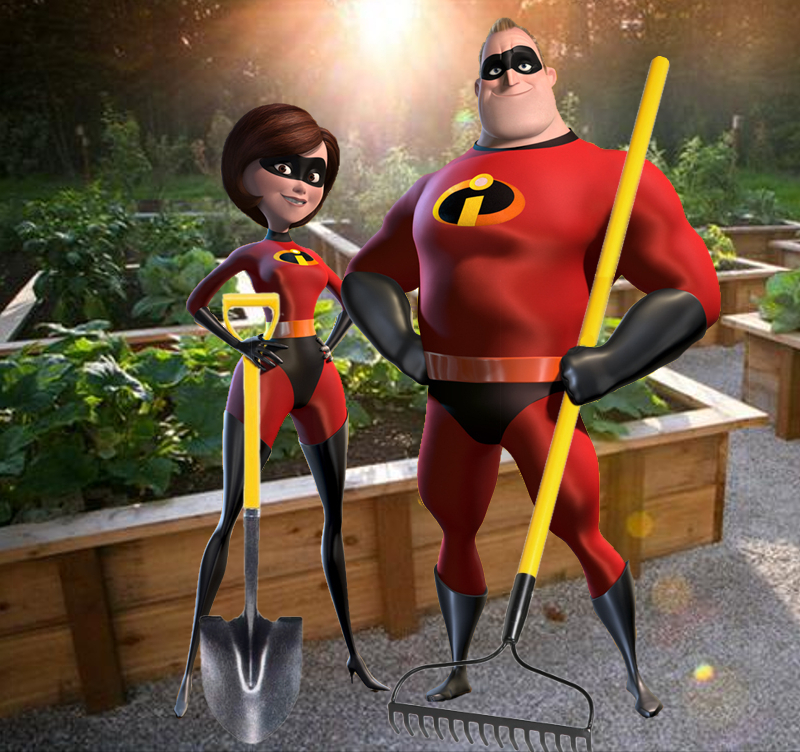 I am sure that the Incredibles always get their garden in on time. And we’ve got to get Penny ultrasounded. If she is pregnant, it is time to dry her up. If she is not, I want to de-worm her using the non-pregnant goat stuff. She’s looking thinner than I like to see her. I finally got the zucchini relish made and canned. Important note to me: get help! It looked pretty straightforward, just some zucchini, peppers and onions, but I found that there is nothing “just” about mincing 14 zucchini, 10 peppers and 8 (apologies to my non-onion-eating family—I feel you wincing) onions. Even with the food processor, it was slow. The zucchini had to be processed one at a time, carefully, lest they puree, and to be scraped down twice. The peppers and onions could go in two at a time, but that’s still 9 rounds. The kids were all delighted with the results, but the little red hen needs to get the other barnyard animals involved in this food project next time. Other stuff in the kitchen this week: delicious butter (I need to order that splatter guard for my KitchenAid—this is so ridiculous), really dry mozzarella (I still have a baby…) and ricotta. We just went out and bought a bunch of oranges. I may attempt marmalade this week. The wisdom of having both a farmer and a farmwife is brought home to me from time to time. Caring for plants, trees and animals is really one job and turning it all into eatables and usables is another. With my big boys and mod cons I can almost make it work some times, but it sure isn’t pretty. And join us in praying and fasting for rain next weekend. We have about half of what we need for a “normal” rainy season. Less than that just deepens this drought. Tags: goats, gratitude, prayer, records, the barnyard, the family, the garden, the kitchen, the orchard | Permalink. …weeks of being sick over here. I went down the 22nd and Isaiah, the last man standing, was doing the fever and chills thing today. It’s all been thoroughly lousy, but the worst was little Joseph over the weekend. For about 72 hours he was only sleeping 20-40 minutes at a stretch, running a pretty good fever and occasionally refusing to nurse for hours at a time. We were a pretty wretched pair for a while. The fever broke up gradually—on-again off-again on Sunday and then finally gone for good sometime that night. Monday morning I felt like I had awakened from a really long nightmare—every time I looked at Joseph (who was finally starting to look and act like Joseph again) I felt like crying and I kept hugging him till his eyes nearly bugged out. Fortunately, he thinks it’s funny to get squeezed. Oh, the agony of sick babies… I am hoping to be quit of this soon. Our super-early Spring marches on whether or not we are ready for it. My husband and the well-ish kids put together about ½ of one of the garden beds yesterday. We have lots more to go. I actually spent a little time yesterday to finally run the numbers to determine how much bed space it would take to feed our crew for a full year. Ready? 470’ of 4’ wide beds AND 480’ of 18” wide beds (for vertical crops, if we decide to go that route). Whee. The biggest space hogs? Peas, at 120’x18” and watermelons at 72’x4’. If we didn’t love them, we’d just skip them. Before Joseph got sick I was starting to feel a bit better and actually turned some on-sale roma tomatoes into marinara and (drumroll) I canned it in the pressure canner. I bought that silly thing about eight years ago and was too nervous about it ever to use it. Well, got that out of the way now. I am now ready for a thousand feet of vegetable garden. Our gas range is less powerful than I wish it were, so I was worried that I might not be able to maintain good pressure, but it all went swimmingly and I actually had to keep a good eye on it to keep it from getting too high. And the sauce is great. I’ll make more as the tomatoes present themselves. I also stuck some sweet potatoes in water in hopes that they’ll send up lots of green shoots that we can then root and plant. They haven’t done much yet. I may be a little impatient. Our bare root stuff has been arriving. My prayer now is that we can get it into the ground before it all dies in the heat. We also have trees, etc to go pick up at our nursery. They’ve been there for the last three weeks! And I still have all the trees to finish pruning before they start blooming! We’ve got to get well. Tags: the family, the garden, the kitchen | Permalink. I am grateful to have a really sick family during a time when we have adequate shelter and clothing. I am grateful we can rest and set aside most inside and outside chores until we are well again. I am grateful for abundant clean water and indoor plumbing. I am grateful for the ability to cook our food without having to go outside. I am grateful that on the worst days, it was easy and relatively cheap to buy prepared or mostly prepared food. I am grateful that when I run out of herbs or other medical supplies, I can simply buy more. I am grateful to have conventional medicine as a backup in case things get serious. I am grateful for immune systems that can and will fight this thing off and that we won’t have to catch this particular bug again. Bodies are amazing things. I am grateful for rain that has been falling with just a few breaks since Friday! The first of the bare root and our scythes arrived this week. We look forward to a return to health so that we can put them to their intended uses! Tags: gratitude, records, the family | Permalink.